Clover growing in the lawn is actually a good thing, but some people want a clover weed killer to remove it from a grass lawn. Clover actually helps convert nitrogen from the air into nitrogen found in the soil, and replenishes this vital element so grass grown among clover is greener and healthier. In fact, some grass seed companies are now including clover in bags of grass seed to disperse it among the lawn right from the start. But if you hate the sight of clover and you want to get rid of it from your lawn, here's how. The best two chemicals to kill clover are MCCP (Mecoprop) and Dicamba. Between the two, Dicamba can be harsh on the environment, so MCCP is preferred for lawn care. Most lawn weed control products or weed and feed products contain MCCP and a combination of various other chemical herbicides to target other weed pests. 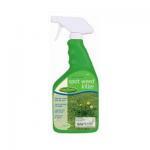 Spot Weed Killer: Spot Weed Killer, made by Maid Brands Inc, is a spray-on spot application product for the occasional spot of clover or other weeds. While an immediate shower will wash the product off of the lawn, in a few hours the product dries to a state where it cannot be easily washed away. Bonide: Bonide is a clover killing spray recommended and used by many commercial turf nurseries. It kills clover, oxalis and chickweed as well as dandelions, which are often tough to get out of the lawn once they've become established. 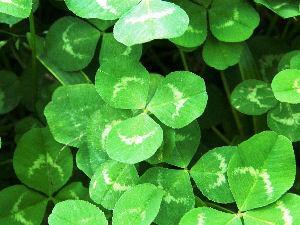 There are several other things you can do to minimize or discourage clover in the lawn. First, set your lawn mower blade at three inches or higher. This keeps the lawn on the tall side but the shade from the grass blades discourages the lower-growing clover. It also mows off the seed heads on clover flowers, preventing it from spreading further. For clover growing in the landscaping beds, try landscape fabric. This porous fabric shuts out light but allows water to soak through. Use it around the base of shrubs, nailing it into place with U-shaped spikes available at the garden center. Cover the fabric with mulch to create a neat and polished appearance. The fabric suppresses weeds while still allowing water to reach the roots of shrubs and flowers. It lasts for several years, depending upon the quality, grade and type of landscape fabric selected. Before dumping more chemicals onto your lawn in the form of a clover weed killer, could you live with your clover? While it used to be thought of as a weed, gardeners now sow clover into the yard because of its beneficial nature. Clover is actually related to garden peas, and like peas, it fixes or takes nitrogen from the air and puts it into the soil. This helps grass grow lush and green. It provides food for gazing wildlife too, from rabbits to deer, and its flowers provide nectar for honey bees and other pollinating insects. If you don't want it to spread, consider simply mowing the flower heads off to prevent seeding. But if you can, keep your clover. It's better for both your lawn and the environment to live with it than to try to remove it.